Let’s wave the Jolly Roger, a pirate’s flag. You’ve probably seen the black flag with a skull and two bones. Why is it called a “jolly roger”? Some say it comes from “jolie rouge”, which means “pretty red” in French. But why “red” when the flag is black? 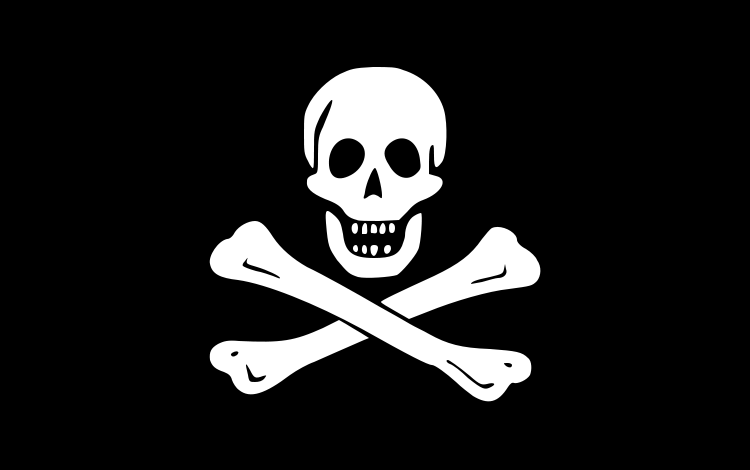 It turns out pirates’ flags were of various colors in the olden days, and many were red. Just like different countries, different pirates wanted their own unique flag, and so there were several designs used. The designs were all meant to be scary and threatening so that the ships they attacked would be intimidated and would surrender quickly. The skull and bones represented death. An hourglass with wings was used to indicate that time was running out. A sword or a dagger or a spear meant that it would be a violent death. A bleeding heart meant that it would be a painful death. A dancing skeleton meant that there was no fear of death. One of the scariest, meanest, most feared pirates, Blackbeard, had a Jolly Roger with a skeleton holding an hourglass and a spear next to a bleeding heart! Aaarrgh!